The evening of June 23, 2017 is a date that Midland residents will talk about for years to come. That evening, mass flooding caused many to lose their homes and caused tremendous hardship for hundreds of others...however few experienced that fateful evening like those of our friends on the Lee Township Fire Department (LTFD). In the early hours of June 24, LTFD responders were called to an emergency involving a woman in a submerging vehicle. Upon arriving at the scene, two LTFD firefighters attached themselves to tethers and, putting themselves in extreme danger, swam out to the submerged vehicle. When they reached the vehicle, the firefighters attempted to gain access to the panicked woman inside as the vehicle began to sink. Stuck in the middle of the deep, rapidly flowing water, with their only platform quickly disappearing from beneath their feet, the firefighters reached into the vehicle, felt around the front seat for the driver and got a firm grip on the woman. Moments later the two brought the woman safely ashore, successfully completing the rescue. 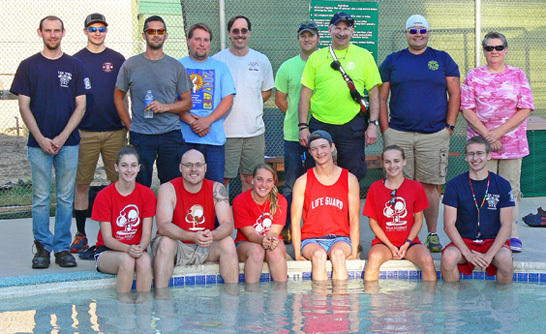 Some of the LTFD’s water rescue training has taken place at the West Midland Family Center (WMFC) with the WMFC Lifeguard Staff. These trainings have covered a multitude of topics including strapping guards to backboards while practicing water spinal cord rescues and working as a team in CPR scenarios. Each training yields new information to both teams which prepares them for future situations. The trainings have also served to build relationships and a trust between the lifeguards and firefighters that will help them work better together should an emergency arise at WMFC in the future. Is training and all the time used for training, really as important as Amrozowicz stresses it to be? “Having the equipment and knowledge without the value of hands-on practice is not adequate. Training is the best way to be successful when emergencies happen,” answered Amrozowicz. Thank you to all medical personnel, firefighters, law enforcement officers, and countless others who helped assist all those in our communities during the events of June 23, 2017. And thank you for the many hours of training that you complete to ensure that you are ready to come to our aid!